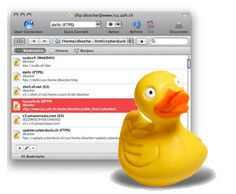 I think Cyberduck is the most user-friendly FTP app out there (too bad it is only for Mac). I was introduced to it a few years ago when I was just barely grasping the concept of FTP and I could connect to different servers & upload files within minutes. Currently the software allows you to browse servers using the following protocols: FTP, FTP/TLS, sFTP, WebDav and browse & upload to Amazon and Mosso’s Cloud Storage. The best thing (for a tech nub like me) is that you can just drag-and-drop the files from your desktop to your server and right click to delete or rename a file on the server. If you connect to one or more servers quite frequently, you can easily bookmark the location and then just pick from the list when you want to connect to it again (instead of having have to retype everything). The app can even synchronize your local and remote directories. Because everything is so simple to learn and the software has so many advanced features, I think it’s a good fit for both beginner & advanced users. Enjoy and, if you are fully satisfied with Cyberduck, support the software creators with donations. It’s the most confusing app I’ve ever used. The directions say, Choose file –> upload, but there is no such thing on my menu. Just file download. Connection never works, confusing, confusing, confusing.